It was a great month, goal-wise! I don’t set ambitious goals, because things always pop up that I’m not counting on. This month it was twenty-four Wonky Hashtag blocks I made for the #Twilter exchange, and a little Super Secret block. 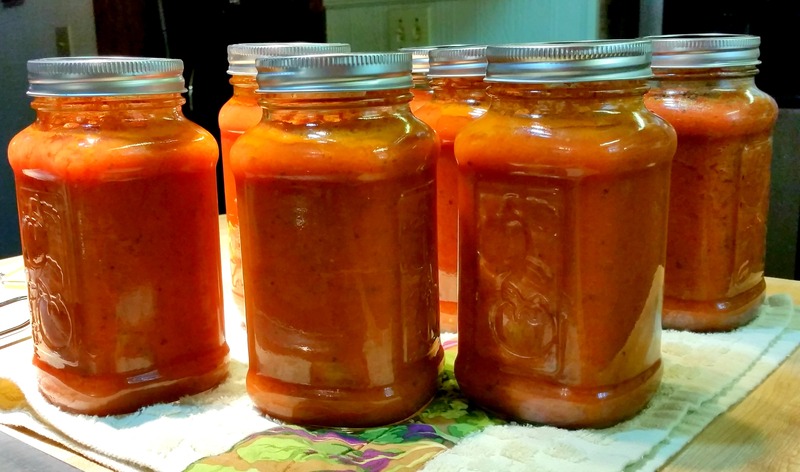 Plus canning and travel and life. But I like this list because it does focus me and prompt me to get a few things finished. The UFO wall hanging is a case in point. It was old (five years?) and I wasn’t interested in it at all. But I dragged it out because it was the only goal I hadn’t achieved and I wanted a sweep. I decided that it should be a throw-sized quilt (The Gold and Turquoise Quilt), which is good because there was a lot of fabric there. 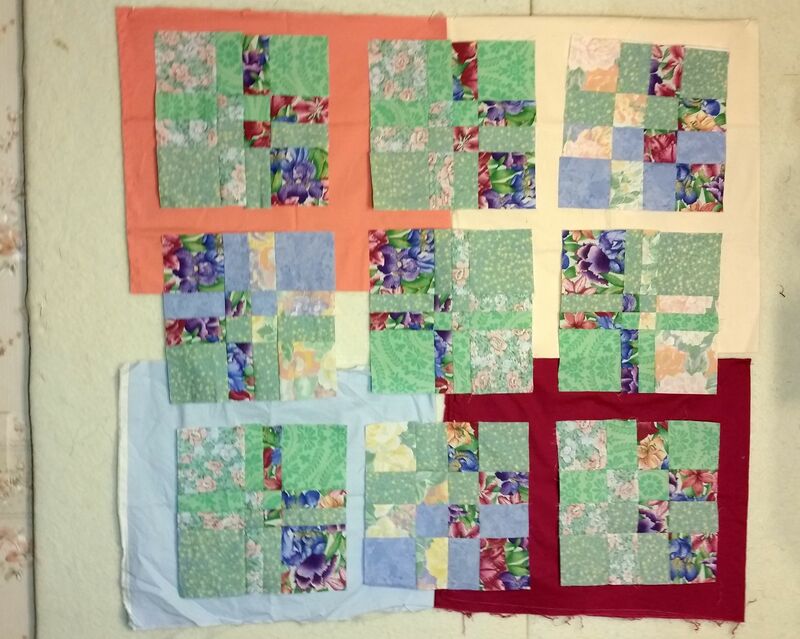 I did fix the mistake in the top, and add a narrow border, and now I’m working on piecing a bunch of scraps into the back. Piece and quilt Boxed Elephant baby quilt commission. 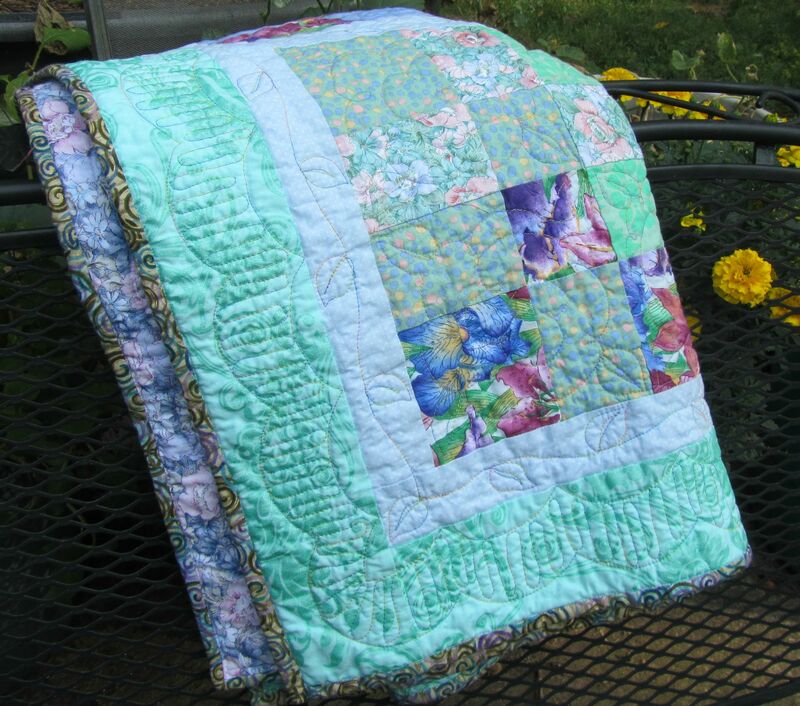 Quilt and bind Gold and Turquoise quilt. Piece top from Twilter Hashtag blocks. 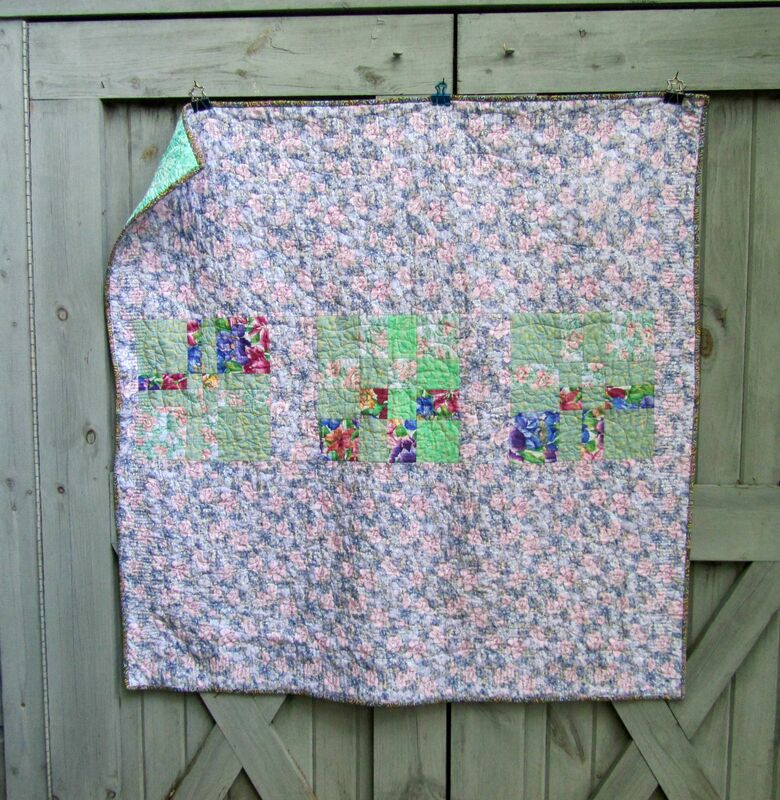 Make new baby quilt with elephant scraps. How did you do with your goals? Hope you’re at least getting into the sewing room when you can. Happy Autumn! 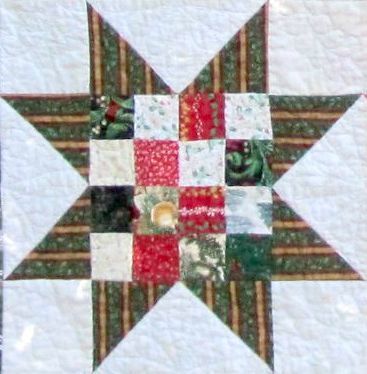 Categories: Uncategorized | Tags: baby quilt, four patch star, goals, hashtag blocks, nautical wall hanging | Permalink. Just thought I’d share my process! And then one and a half yards came in, some teal with white elephants that will go out again soon in a commissioned baby quilt. 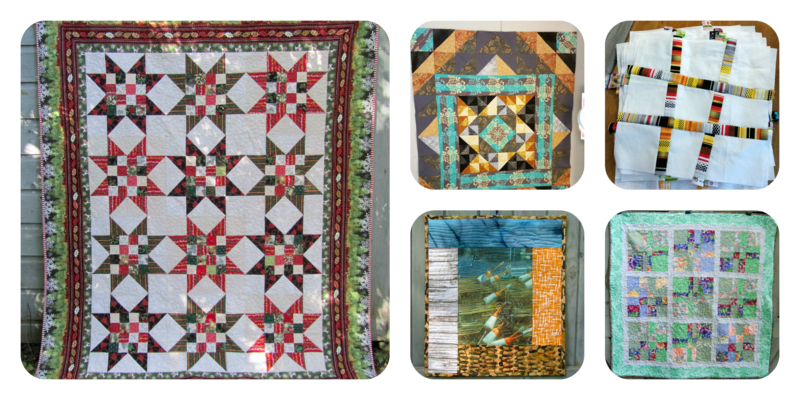 Did you see that The Quilt Show is showing a 2 hour Feather Fundamentals program for free today? I may need to watch that! Categories: Stash | Tags: Evening in the Garden, Hashtag, twilters, Valerie Root | Permalink. Beautiful sewing weather here! 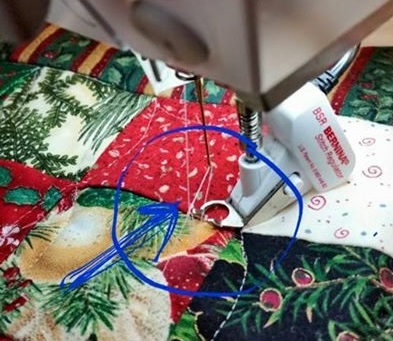 This week I finished The Very Large Christmas Quilt, but I don’t have good photos yet, so all you can see is the binding. Looks good enough to eat, doesn’t it? All 300+ inches of it! No, the binding went fast. Machine binding is one of my favorite parts. 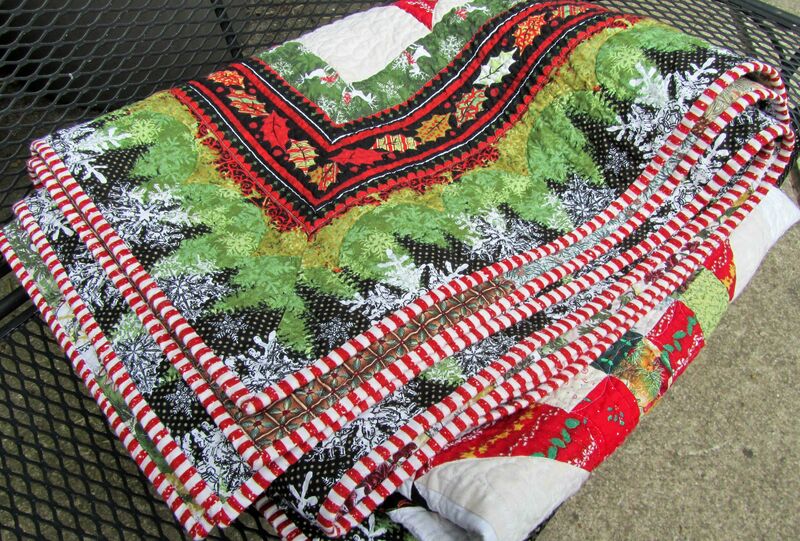 The quilt was heavy and unwieldy to quilt, but it used ten and a half yards of fabric, including a lot of old pine cone and Christmas fabric, as well as some new pretty yardage. Fifty yards looks like a piece of cake now, doesn’t it? Could I do one hundred? Hmm. Hope you’re doing well with your stash! 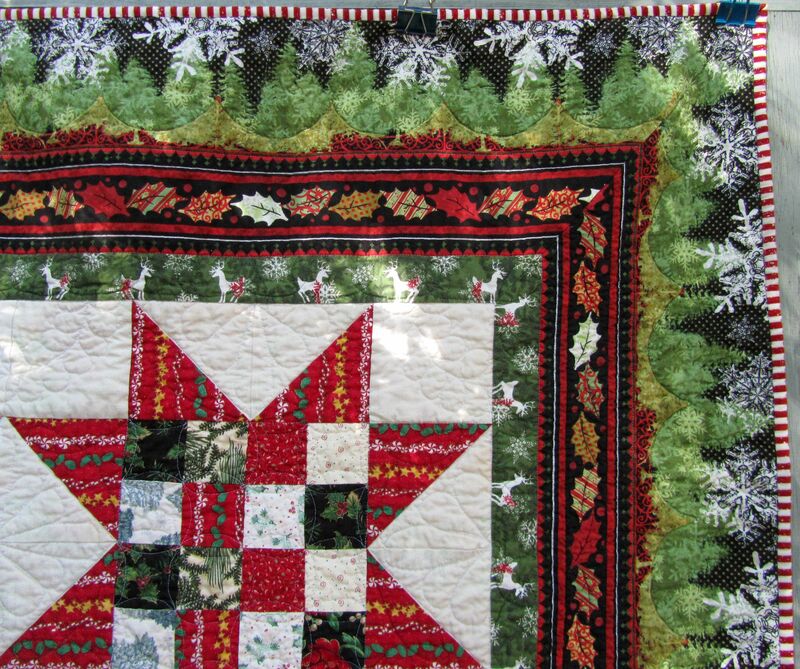 I’m linking up to Judy’s report at Patchwork Times. The weather changed abruptly here this week, and today is a cool, crisp, sunny fall day. Did I work outside? 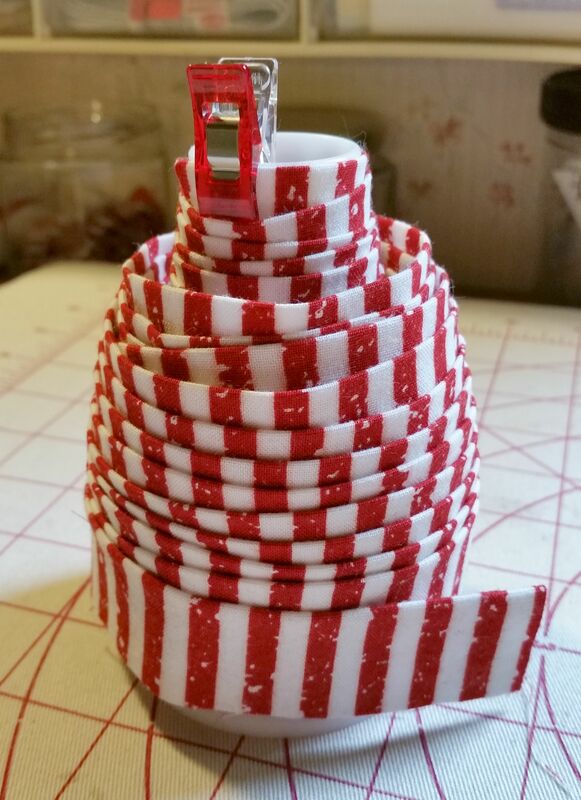 No, I sewed most of the day, till my thread started shredding, and I decided that retreat was in order. Live to fight another day, etc. 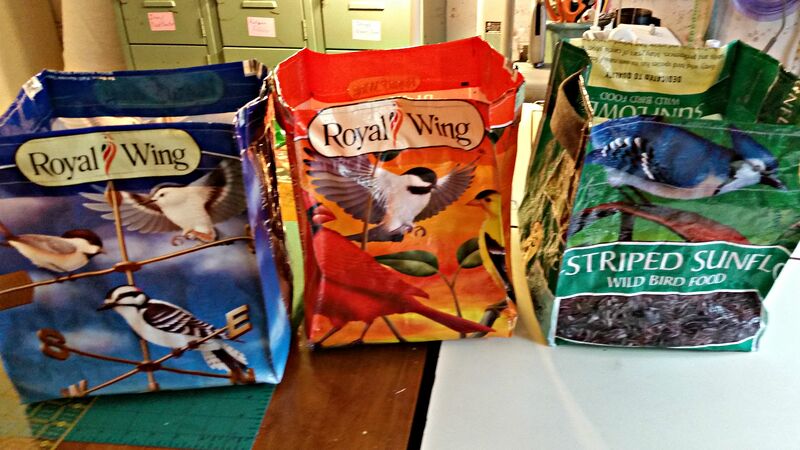 I spent the last few days making these storage cubes from bird seed bags, so no fabric was used there. Anyone interested in a tutorial? I did make these twelve hashtag blocks for a #Twilter swap coming up, so I used two and a half yards there. These aren’t trimmed yet, but they’ll be twelve inches square. I have more to make, but I’d had enough so I took a break. And, no new fabric came in this week! I appreciate everyone’s comments! Sometimes I’m bad about replying to them. Sometimes they don’t really seem to need an answer, since they are already an answer, and someone has to hang up the phone! Sometimes I just don’t get to them, or I’m on the wrong device and can’t see your email. This week I answered a bunch of nice comments, and now I don’t see most of them in my sent box, so I have no idea which ones got through. Sigh. Thanks for reading, anyway! Good luck on your destashing! 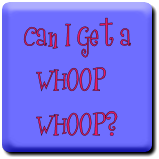 I’m linking up to Judy’s report at Patchwork Times. 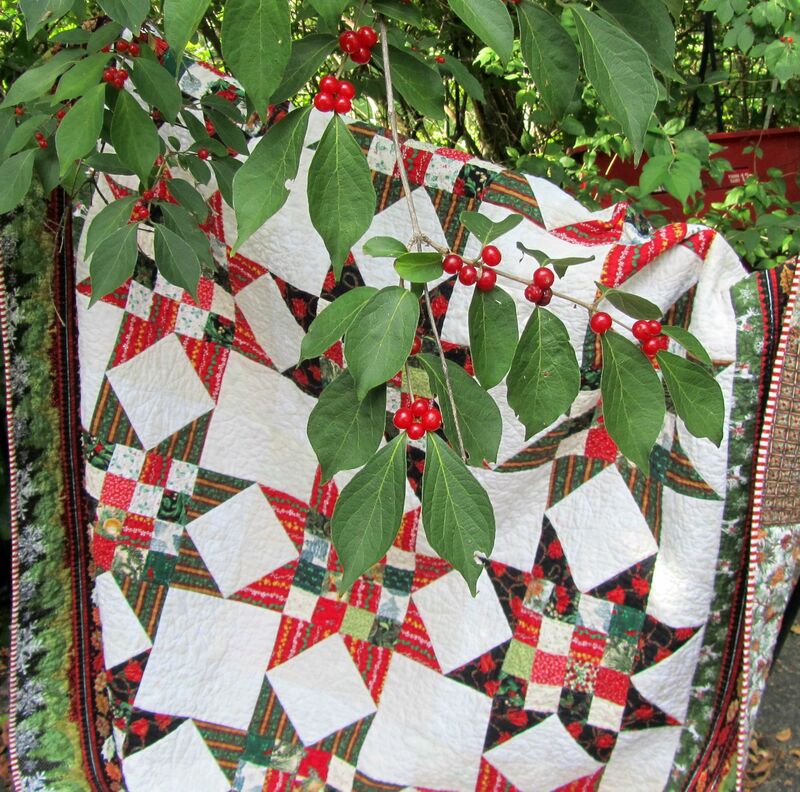 This quilt began with rummaging though my 6.5″ scrap bin. 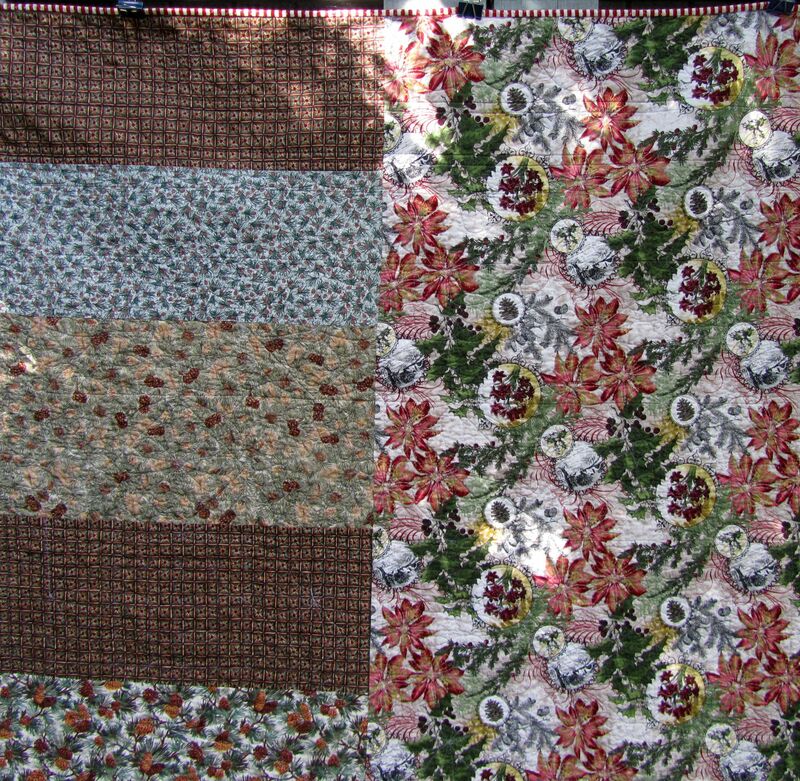 I pulled together these pretty florals and semi-solids. Some were more recent, but some were OLD and needed to go. It is nice and square, even though it didn’t want to hang flat for the photo. Yes, I cut the four-patches different widths. That was a… design choice! I kind of like it. 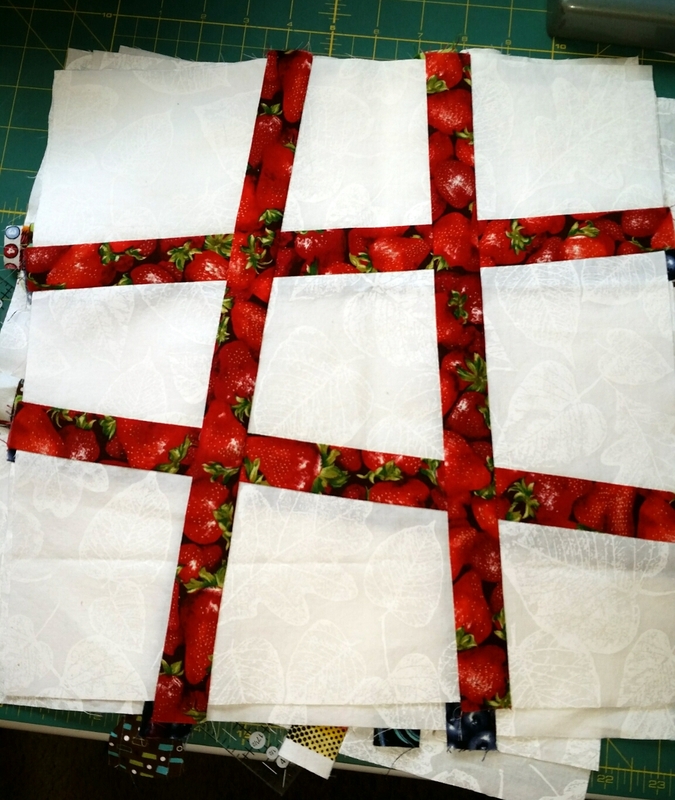 I was originally going to use all twelve Disappearing Four Patch blocks for the top, quilt it, bind it, and be finished. No matter how I turned the blocks on the design wall, they looked like…well, not good. Sashing was in order. The #Twilters and I looked at a number of choices. The deeper ones were appealing, but not soft for a baby quilt. 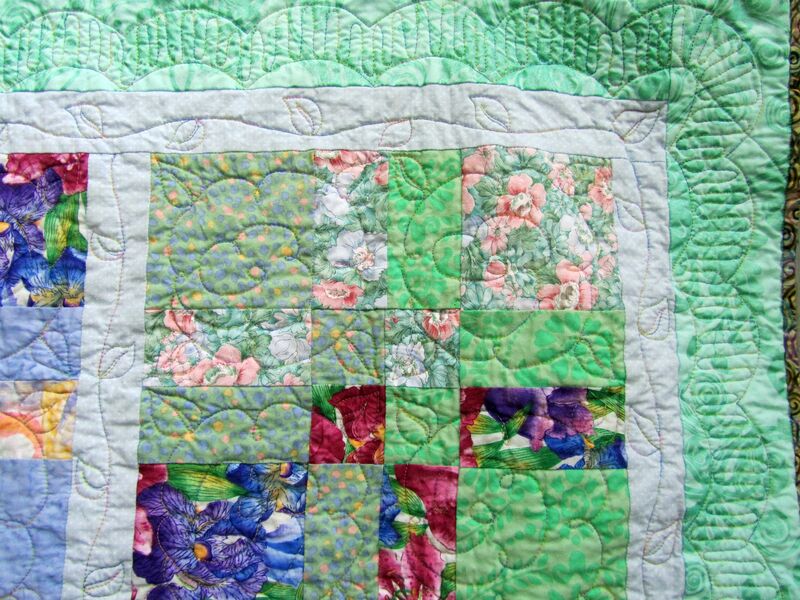 In the end, I went with a soft blue dot for sashing and a two-tone green for borders. 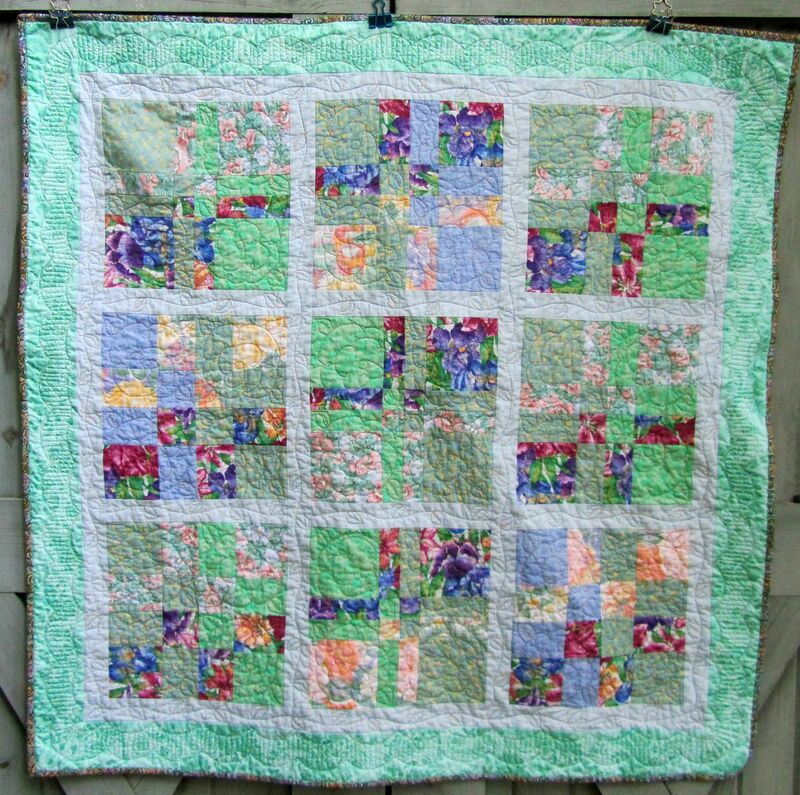 Quilting was lots of vines and flowers, with minimal marking. 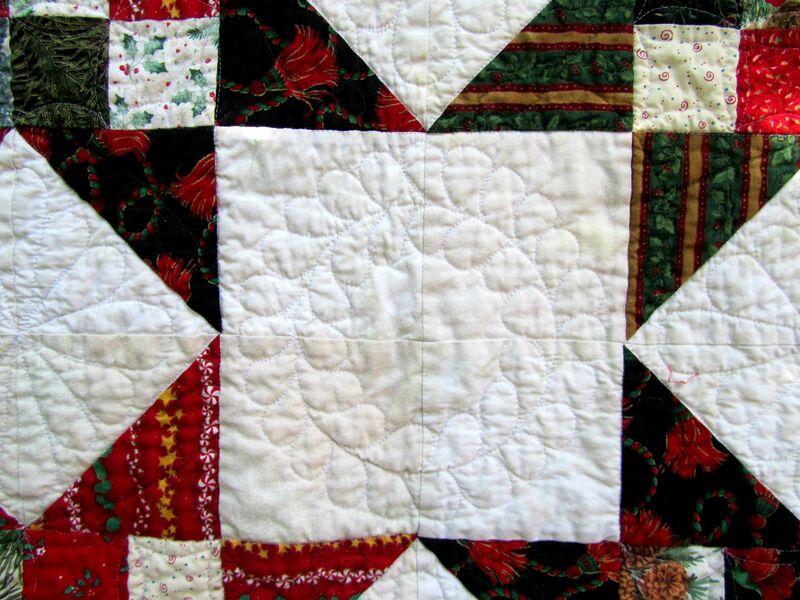 The largel-scale quilting left it nice and soft. 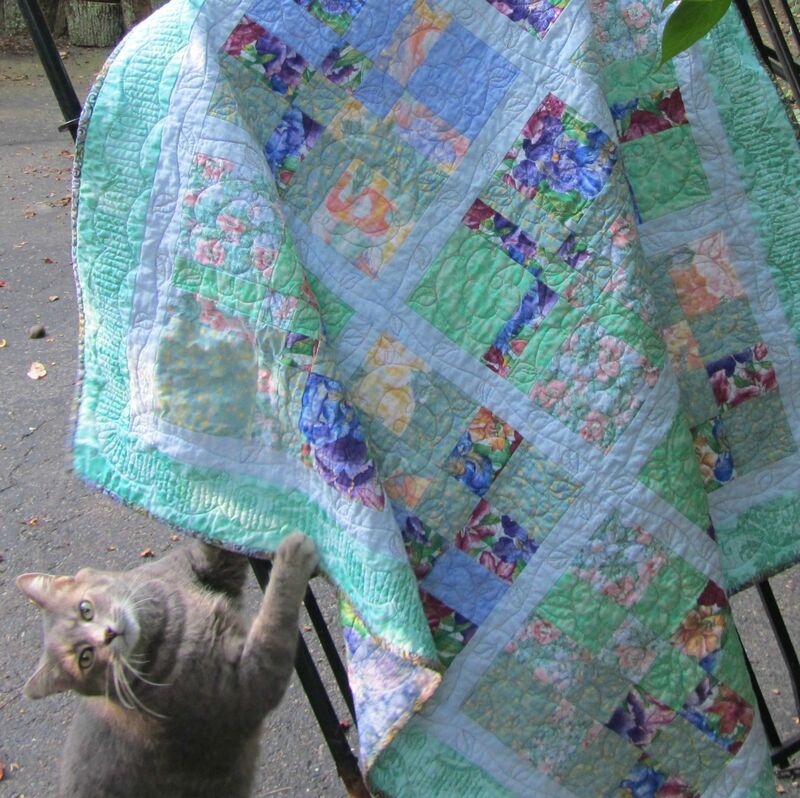 I used a variegated So Fine by Superior for all the quilting. It shows up, but echos the soft colors. A special thank you to my photography asisstant, Yuri. This is headed for Project Linus. 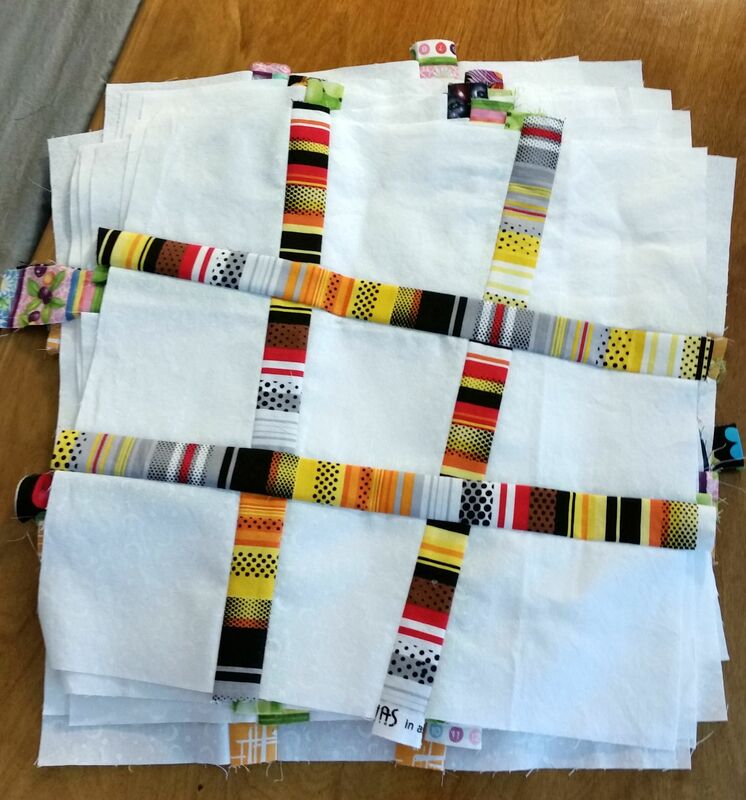 Linking to Michelle’s Let’s Make Baby Quilts and Free Motion Maverics at Lizzie Lenard’s. 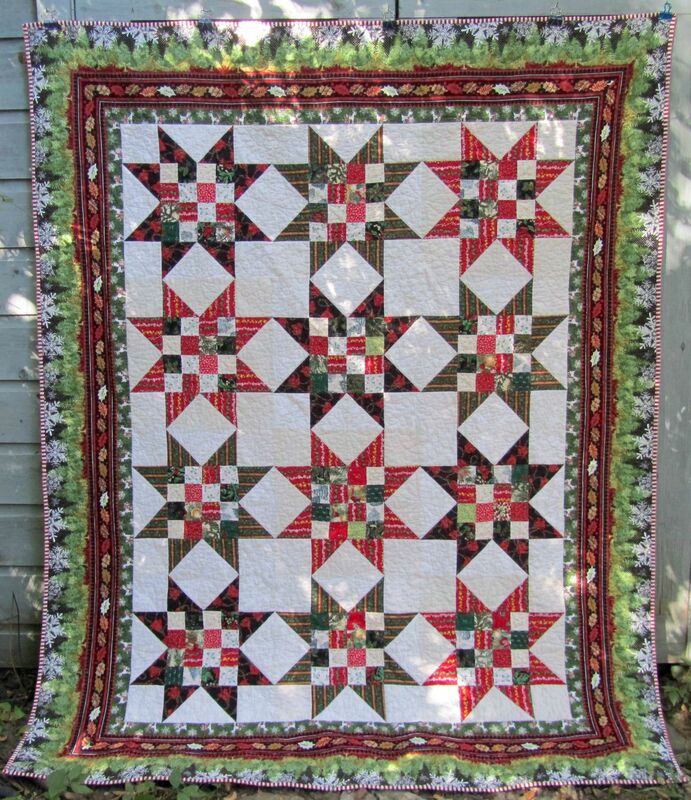 Categories: Donations, Finishes | Tags: baby quilt, Evening in the Garden, superior thread, Valerie Root | Permalink.